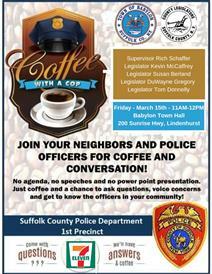 Join your neighbors and Police Officers for coffee and conversation! No agenda, no speeches and no powerpoint presentations. Just coffee and a chance to ask questions, voice concerns and get to know the officers in your community! Coffee provided by 7-Eleven.